First of all, PLEASE READ these entries Click me,baby! , Click me,darling! and Click me,sweetheart! This is because if you never read about those before, you might can't understand what I am writing about now. Second thing is, I want everybody to know that I am writing this post is NOT because of I am obsessed with that panda kay! Just so you know, he BLAMED me for so-whatever-thing for several time since the day I know him. Do you agree with me that he is abnormal?! For me, he is INSANE! foongpc@carolinemayling now i blame u cos u didn't advise me to sleep early! LOL! 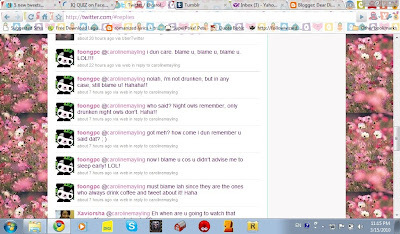 foongpc@carolinemayling nolah, im not drunken, but in any case, still blame u! Hahaha!! 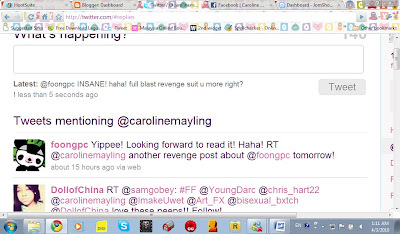 foongpc@carolinemayling i dun care. blame u, blame u, blame u, LOL!!! why u spread ur sleepiness to me? I blame u!! LOL! 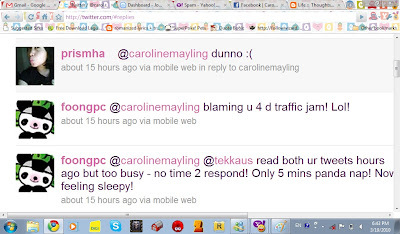 foongpc@carolinemayling blaming u 4 d traffic jam! Lol! 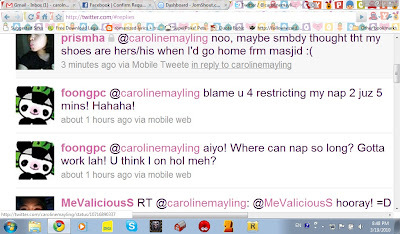 foongpc@carolinemayling blame u 4 restricting my nap 2 juz 5 mins! Hahaha! Frankly. I never been blamed for this much by someone that I just know not for long. Well, congratulation to him that he broke the record. Last night, we tweeted halfway and then turn to facebook there continue chatting. Lol! I guess Saucer saw our tweets and he tweeted and asked if he can tag along. LOL! 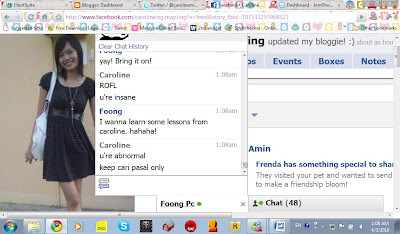 Actually, chatting with this panda is fun, but just that he always trying to get on my nerves! He keep asking me what's the pressie for the winners - Uncle Tekkaus, Merryn and Bananaz - that I am going to give. He asked for pressie too! For bringing traffic to my blog. Kay doesn't matter about it..
Oh! I showed him this one - Her Stories by Merryn - and he is JEALOUS! haha I forgot to print screen when he typed this - im jeles. Another one, I showed him what I wrote about Uncle Tekkaus! now 21st century no more ladies 1st! see this panda not gentleman at all! Though I said I am going to blog about my revenge towards him, but forget about it. Well, he ever told me last time when we chat that he was born on 1st December too, I thought he bluffed me. After read almost all his blog post, and found out "Oh! his birthday on 1st December too. LOL~"
Maybe we can celebrate our birthday together next time! Lol. I am still following and reading his blog. His blog is fun and for those who always wanting to get prizes, go his blog, lots contest a there! His blog also full with foodies, so prepare yourself before start reading it, don't let yourself starving. Lastly, well I guess this is the only reason why I cannot finish reading his blog, it is because he blogged about GHOST STORY! I skipped it when reading his blog. I know if I read it, I am 100% sure that I can't get my sleep at night. Alright this is for foongpc! Aiyo! Why reveal all our conversations? Where to hide my panda face now? Hahaha!I'm going to blame you for this embarrassment! chey!!!!!!!!!!!! foong sudah dapat the FC! Huh? You didn't read my ghost stories? Faster! Faster! Go read them! Guarantee will have sleepless nights, hehe. Thanks for mentioning me and dedicating one full post (and a few other posts) to me! Why are you so obsessed with me? LOL!! @Merryn: oops.. not u owh. :( alaa cant put ethan's pic here. Bananaz and I won a lot lately leh.. we both won something else from another blog too.. hahaha..
winners? i won ? what? did i miss any post? huh? 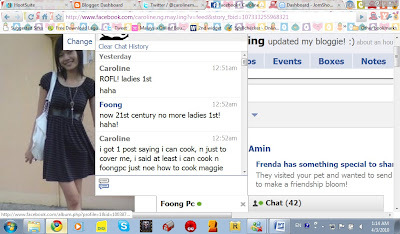 lol..
now i know foongpc more deeply. he is funny and insane guy wakakaka. but he is cool man too. =.= I think kan... I am not sweet and crazy enough for ppl to write about me. LMAO. @Irenelim: OMG! Pretty lady panda?! u kidding me? later u wan a panda model ur apparel still? wahahahahaha! yup i rcvd it dy. :) thnx. Oh? I was born December 2nd...so I'm one day younger than you! Muahahahahaha!!!! I believe both of you are really meant for each other. :p because your BD are the same. @Christopher: UNCLE TEKKAUS! how cud u?! hmph! 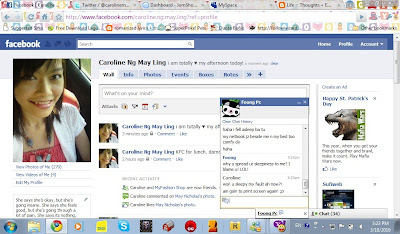 whr got chat sooo much! only once in a while ba! @InsaneOnion: yea right! especially complaints! haha or about wat to eat.